There are typically some planned or ad-hoc periods of time, during which your system undergoes maintenance activities that can cause service disruption. During such periods, you wouldn&apos;t like annoying alerts to be generated. In addition, you wouldn&apos;t like such periods to be taken into account when calculating the availability percentage of your system. To avoid such unpleasant situations, Dynatrace enables you to define maintenance windows. In general, it’s good practice to keep your performance monitoring system informed of scheduled maintenance windows to ensure accurate monitoring data. 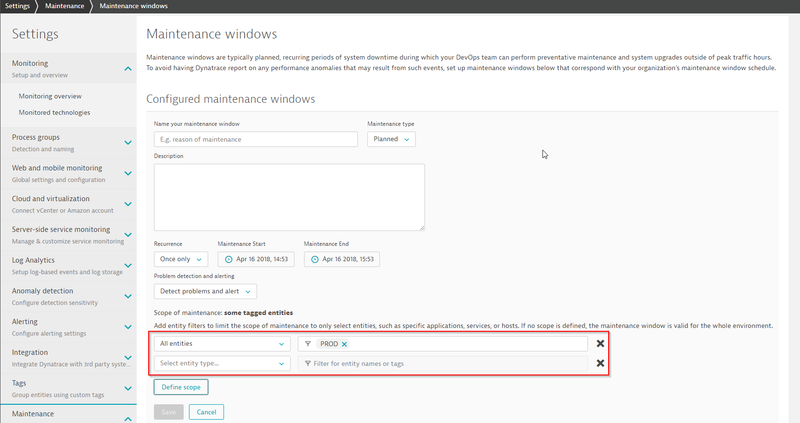 Dynatrace enables you to define maintenance windows using either the REST API or the web user interface. Dynatrace distinguishes between two types of maintenance windows: planned maintenance windows and unplanned maintenance windows. 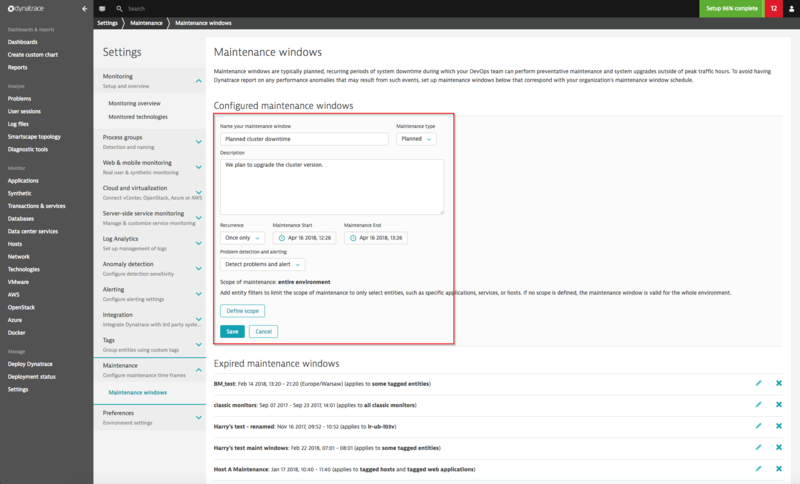 Planned maintenance windows are configured in advance while unplanned windows can be added retroactively to notify Dynatrace of unexpected downtimes that shouldn’t be factored into overall performance and availability baselines. Planned maintenance windows are defined in advance and can be used to disable alerts on problems detected during the window. Planned maintenance window times are excluded from synthetic SLA report calculation. Response times and error rates during maintenance windows are excluded from regular baseline calculation. Once a maintenance window is defined, Dynatrace automatically excludes the configured time period from its baseline calculations. With this approach, any response time anomalies that occur during the corresponding rolling update won’t negatively influence your overall service and application baselines. With respect to baselining, it’s a good idea to define your maintenance windows before performing any load testing. Using maintenance windows during load testing ensures that any load spikes, longer-than-usual response times, or increased error rates won’t negatively influence your overall baselining. Each maintenance window you configure has a name and description that you can use to provide contextual information about the purpose of the maintenance window. Go to Settings > Maintenance > Maintenance windows. Define a Name for the maintenance window. Provide a Description of the purpose of the maintenance window. From the Maintenance type drop list, select Planned or Unplanned. If the maintenance window is to recur on a regular schedule, use the drop lists to define a daily, weekly, or monthly recurring schedule. Detect problems and alert: Dynatrace will automatically detect and report all problems as usual and display a maintenance window icon (wrench and bolt icon, see below) on each problem that is detected during a maintenance window. Detect problems but don’t alert: Problems will be detected but Dynatrace won’t send out alerts for the problems. Each problem will be listed on the Problems page with a maintenance window icon. Disable problem detection: Detection and alerting of problems is disabled. Problems that occur during scheduled maintenance windows will not be included on the Problems page and no alerts will be sent out. By default a maintenance window is defined for your entire environment. By using scopes you can define fine-grained boundaries for monitored entities that are affected by a maintenance window. You can include entity tags for specific Applications, Services, or Hosts (see host tag example in the image below) or for tagged groups of components (for example, all hosts that have the tag PROD. Note: In a correlated problem, a single incident coming from a maintenance-configured component is sufficient to automatically flag the entire problem as a maintenance-related problem. The scope can also be set to any process group where every process that is grouped under the same process group is affected. Refer to Dynatrace Help for more details about our maintenance window API. Even if you&apos;re viewing a host overview page and you select a global timeframe in which the selected host was under maintenance, Dynatrace shows you the details on the Maintenance tile. If the host is included in multiple maintenance periods, Dynatrace shows you the most recent window and a count of how many maintenance windows the host experienced during the selected timeframe. 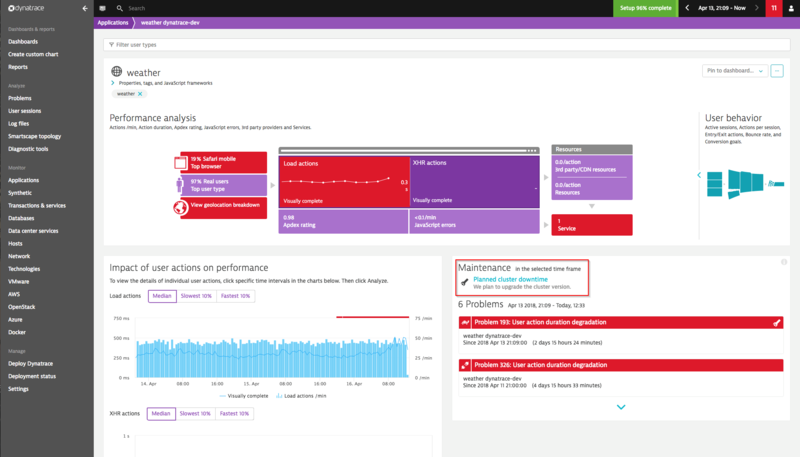 Maintenance windows enable Dynatrace to identify periods of possibly abnormal operation, such as downtimes, reduced performance periods, and high-traffic events during load tests. Defining maintenance windows during abnormal operation times helps you reduce alert spam and keep your baseline clean for accurate monitoring and alerting. By providing a convenient and powerful automation API your DevOps teams can automatically create or modify maintenance windows in sync with your release pipeline.